BOZEMAN — Catherine Russo is a state champion again. 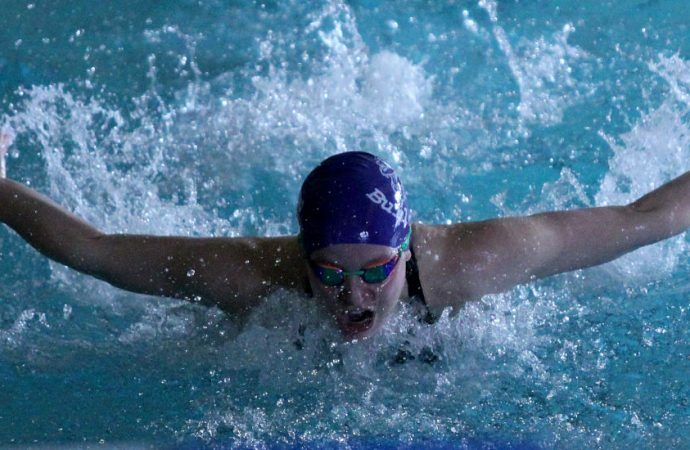 The Butte High junior rolled her state individual title total to six — the most it possibly could be — by winning the 50-yard freestyle and 100-yard butterfly titles Saturday at the state swim meet at the Bozeman Swim Center. Russo won those events as a sophomore and freshman. She is undefeated in high school races in both. She was also part of an All-State team in the 200 freestyle relay. Russo swan anchor along with teammates Anna Trudnowski, Kallie Hossack and Devin Amtmann to place fifth in that event. The top six in each event earn All-State recognition. The same four girls placed seventh in the 400 relay. In the consolation finals, Trudnowski, a sophomore, swan to 10th place in the 100 free and 12th in the 100 backstroke. On the boys’ side, Bulldog senior Zach Johnson capped his career with two more All-State showings. Johnson placed fourth in the 50 and 100 freestyle races. He broke the school record in the 100 free with a time of 48.49 seconds in the preliminaries. Junior Max Holdsworth competed in the consolation finals, placing ninth in the 50 freestyle and 12th in the 200 freestyle. Max Holdsorth, Coby Cashell, Thad Holdsworth and Zach Johnson earned All-State honors with a sixth-place showing in the 200 freestyle relay. Evan Zundel, Johnson, Max Holdsworth and Thad Holdsworth placed eight in the 200 medley relay. Butte High’s girls placed sixth, and the Bulldog boys took eighth. Individuals placing in the top 12 score team points. Complete results for the meet are not yet available.